I got a lovely poem off a friend’s facebook wall. If they are cruel, be kind. If they are mean, don’t mind. If they reject, don’t fret. If they exclude, love still. If you cannot, God will. If you lose hope, just wait. Just the kind of thing I need on Monday to remind me what it is all about. The writer is giving a positive spin and exhortation as I can think of many places where this is not the case ‘Come apart from the world for a while to our country club’. The phase I often go round with as a useful summation of Christianity to Christians is ‘You are blessed: now go and bless others’.. When he gets to the overarching storyline of the Bible (I happen to think there are several). He talks about the traditional view…eden…fall….condemnation, then either salvation/damnation. This is only a summary but it is a dominant way to read the Bible: Eden, goodness, fall, attempts to scrabble back, Jesus, a new way etc. He argues that this is based largely on a reading of the Bible based on looking back through Calvin/Wesley/Luther/Aquinas/Augustine etc and not looking forwards from Adam/Abraham etc. We have to see Jesus firstly as part of a story emerging through his ancestors. No one in the Hebrew scriptures talked about ‘original sin’, ‘total depravity’, ‘the fall’ or ‘eternal conscious torment in hell’. Many of these concepts owe much more to a Greco-Roman world view (I’d have to agree here, but I’d also say that latter concepts can be useful- just as long as we are clear). I’m blogging this as a way to force me to read and to break down complex ideas. This is where you have to read McLaren and not read what others say. Some would read that last paragraph and be initially alarmed. I was. But there is much value in reading and listening carefully. It is far easier to read a summary and attack. ‘It’s time to abandon the long experimental project of recasting the Bible in an alien narrative and reframing God in an alien story. It’s time to stop holding God’s people captive in an alien construction. God liberated his people from the economic and political concentration camp of the eygptians and the babylonians; perhaps now it’s time to be liberated from the conceptual tyranny of the Greco-Romans as well’. and now I’ve got a headache and I’m going to have to lie down and listen to some music…. The first part of the book (p1-214) has took me ages! This is why I cannot understand some reviewers who are able to dismiss it in one, terse, angry paragraph. It is worth dwelling on this as it is full of nuances. He begins with his real experiences of being a pastor. I was impressed with this. I have read ‘controversial’ books that were written from the safety of a university study and did not seem to interract with real life. I loved the bit where he highlights a growing sense of being stuck between ‘the brutal tension of something real and something wrong in Christian faith’ (p9-10). I often feel this- I’m more and more attracted to the wildness of Jesus and the wildness and unpredictability of scripture and I long (and do, increasingly) to share this. I am more and more turned of by mechanised doctrine written in angry capital letters that cannot cope with the wildness of Jesus or scripture. I’m cheering with him as he talks of modern Protestantism in its liberal forms and evangelical forms ‘both sides increasingly reacting to one another and losing touch with the changing world outside their religiously gated community’ (p11). This is the strength of McLaren- he is a poet, a gadfly and I feel, you have to read him as such. 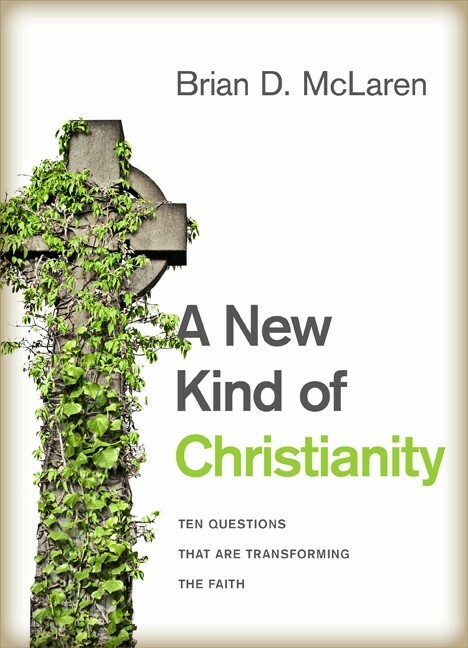 Then he traces what issues have led him to write- the growth and development of Christian tradition, how it has shifted and changed and also questions he has received from others like; ‘is God violent?’ ‘If the Bible is God’s revelation- why do Christians disagree so much?’ ‘what is the gospel?’ (these are normal questions that people ask). My reservation was with the title of the book- it sounds presumptious. I love the quote he uses- he is not attempting a new blueprint, but ‘responses’ . It was months ago, when spurred on by http://www.narrowseventhirteen.blogspot.com/ that I bought a copy of ‘A new Kind of Christianity’. I promised a review within days. Well it has been months- partly to do with my lifestyle and partly to do with the richness/intense nature of this book. I want to make one or two things clear. Firstly: a couple of years back, I met Brian McLaren. I found him to be a gracious and open man. I also watched him speak, watched how he related to others and watched how he dealt with hostile questioners. How I saw him, affects how I read his book. If I meet you in the flesh and discover you to be generally graceful and interested, I will cut you a lot of slack. I will listen to you. Secondly, I was in a meeting last week. Someone began to express an opinion that did not seem ‘orthodox’ (well I disagreed with it!) yet was open, very open and trying to grapple with it in public. I watched one person of, shall we say, very evangelical views, and it was almost like watching a crocodile waking up and slithering off a bank, ready to attack. It seems to me that if one is convinced that one has ‘the truth’ one should be confident enough to listen in good grace and at least ask open questions to try and understand/explore/seek common ground and only then begin to, in good grace, disagree. There are too many of my colleagues who seem more ready to score points, play to their camp rather than listen. To me, this betrays not a confidence in the truth, rather an insecurity in the truth. So I’m sat here in my study/office/den/house tip…. and I’m praying or trying to pray. What do you pray on a Sunday morning if you are a professional God botherer? Millions to be ‘saved’, for a ‘good message’? ….. and how do you pray without using jargon or well-meaning phrases- both of which I expect God sees through and understands. I’m always in a quandary. I find it harder, being evo- things are changing now- but I kind of got messages that God has only blessed when their are lots of people there. As I get older and less wiser, when I’m in this position and I’ve run out of words it seems all I can pray is the old orthodox prayer ‘Lord Jesus Christ, son of God, have mercy on me a sinner’ and try and be still and listen…. I read this yesterday in ‘More Ready than you realise’ by….. I don’t find that depressing- I find that liberating………indeed helpful in trying to bring a message whilst trying to step out of the way and not keep saying ‘me….me’….and try and count the 100s who are there (always a problem in British Methodism- working out how to seat the vast numbers that areÂ there… ok, there could be a touch of ‘evangelical exaggeration’ there…. ).